I have been to that website and took a random example from it; it literally took me 15 minutes of basic research to debunk their misrepresentations. Regardless, not only have men orbited the Earth, but they have built giant space stations and landed men on the moon; vehicles on Mars, Venus, and the asteroids. We have launched four probes to the STARS. We have achieved so much with even more to do and discover. We are lucky to be alive now, in the century of the Solar System. 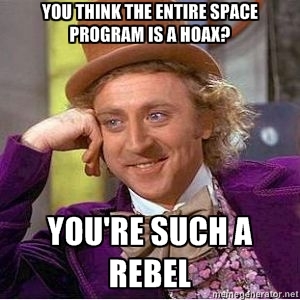 Imo,no one went to the moon and no one walked upon the moon either and so why wouldnt everything else about our space program also be a hoax and a lie? we went to the moon. the van allen belt is overrated, your cold brittle theory is bunk this close to the sun. And so what about the pioneer and voyager deep space probes that are now well beyond pluto and are too far away to be effected by the suns warmth? they have heaters, which was recently turned off to save power. originally designed to withstand -38 °C they are still operating at -79 °C maybe even colder since the thermometer only goes to -79 °C. either way they are still not at -270 °C. Voyagers I and II both use Radio-isotopic reactors to power their systems. The plutonium in the reactor generates heat which is converted to electricity through thermocouples. Residual heat is used to warm the vehicle. The Pioneer probes most likely have already died, but the Voyagers have a least ten more years left. You do not have a clue about basic science, physics, or even the principles of good grammar and proper spelling. If you really want to learn, open your eyes and ATS can teach you. Warm the vehicle on the inside perhaps,but those heaters,that are somehow able to keep heating for over 30 years? are not going to be able to keep the outside of a space probe warm,a space probe thats beyond pluto,supposedly traveling around 30,000 mph,thats 15 times faster than a bullet,within -455 below zero fahrenheit temperatures,thats 4 degrees above absolute zero and i dont believe those probes are even really out there anyways,what proof do we have? other than green/blue screen movies and faked photos? This should'nt be ignored and dismissed,because like it or not,it isnt out of the question and its a very real possibility that i think and believe is true..
Generally, of course it's not out of the question. There is state-funded science and non-state funded science. State-funded science should always be constantly questioned and critiqued much more severely, preferably done away with.